For the first time in franchise history, the Houston Astros are World Series champions. With a 5-1 win over the Dodgers in a decisive Game 7 Wednesday night, the Astros delivered a long-awaited championship to a city still reeling from the devastation of Hurricane Harvey earlier this fall. Game 7 itself was rather anticlimactic considering the twists and turns that filled the entire series. Just as they did in Game 3, the Astros jumped on Los Angeles starter Yu Darvish early in the game. By the end of the 2nd inning, Houston had built a 5-0 lead that would hold up. Meanwhile, Houston starter Lance McCullers Jr. pitched himself into trouble during the first two innings. But despite lacking his best stuff, McCullers managed to get himself out of trouble. But sensing that it was just a matter of time until McCullers gave up a big hit, Astros manager A.J. Hinch pulled him after 2.1 innings. It was a risky move putting the game in the hands of Houston’s bullpen, which has been unreliable for much of the postseason. But Brad Peacock delivered two scoreless innings and Charlie Morton pitched the final four innings. Morton gave up a run in the 6th inning, but otherwise cruised through the final innings and was named the winning pitcher in Game 7. With Springer hitting .379 with five home runs, even after going 0 for 4 with four strikeouts in Game 1, he was the obvious choice for MVP. Time after time, he was the catalyst that sparked Houston’s offense. That includes Game 7 when he led off the game with a double, ultimately scoring the first run of the game. One inning later, he hit a 2-run home run off Darvish to help knock him out of the game. Springer’s five home runs tied the record for long balls in one home run. He also set a new record with 29 total bases in a single World Series. By winning MVP, Springer now has a trophy that bears the name of his childhood idol, Willie Mays. 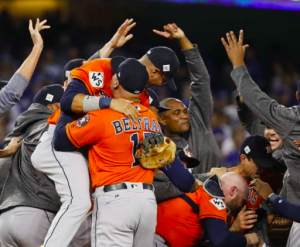 Houston’s championship was the culmination of a four-year rebuilding process after the Astros lost over 100 games in three straight seasons from 2011 to 2013. Since then, the Astros have slowly added young talent to the organization. Sensing they were close to competing for a championship, the Astros were more aggressive in making signings and trades over the last year. The addition of Justin Verlander at the end of August was arguably the last piece of the puzzle that put them over the top. Even amidst the raucous postgame celebration, the Astros are already thinking about their chances of repeating as World Series champions next year.